After getting kicked in the gut last weekend, John Carter fans are coming out of the woodwork and it sounds like they’re ready to fight for the future of the franchise. Barely six hours ago a group composed of film crew and fans started a Facebook group “Take me back to Barsoom! I want a John Carter to have a sequel!” and they’ve already landed a thousand members. 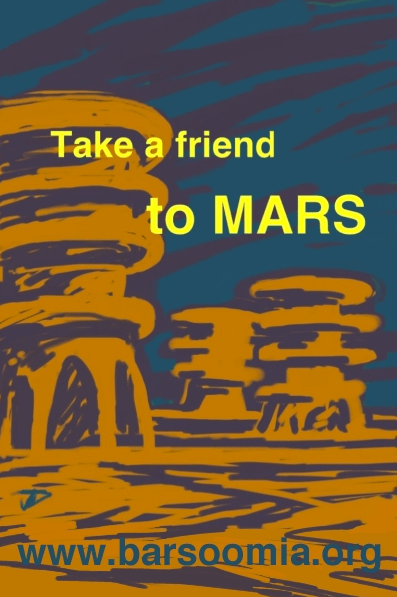 Meanwhile other fans are beginning to buzz about “Take a friend to Barsoom!” — an initiative started by longtime Edgar Rice Burroughs fan Jeff Doten (http://barsoomia.org) Doten’s idea comes with fan-made art urging fans to grab a friend, or friends, and take them to Barsoom. Here at JCF — our view is that this weekend is the time for every fan to do something to make some voise. Grab a group of friends and take them to Barsoom. You have to remember that Hollywood is all about expectations, and the expectation is that John Carter will, like every other major film, drop off by 40-50% this weekend. If that doesn’t happen — if fan activism makes for a strong hold — it will be a message that is heard across the entertainment industry. So get ready — grab some friends and go to Barsoom this weekend. Then get registered on FaceBook and become part of the Take me back to Barsoom movement — and it really is just that, a movement, fan generated and fun. Time to fight back. Thanks for getting this out there Michael ! I have new versions of the artwork on http://www.barsoomia.org with space for you to put your own name on them. I’m encouraging people to also make up their own versions – the more the better ! I have already and will continue to do so. Evangelizing day by day. Went back for the second time yesteday with two friends, both liked it but not as much as I did. I wanted to see it again next week but other friends want to go to the 3D version (I’ve watched it in 2D both times). Is it any good? I’ve read reports of a very bad 3D conversion, so I don’t want to ruin the experience. Anyway, really hope we’ll be able “to make the difference” (as Dejah says to John) and save this great film! I’ve already seen it and I am actually taking a friend tomorrow to see it again! Can’t wait because I know he will love it too. I am going to see it again on Friday!! And with any luck I might see it on Monday night..who knows if I’m feeling saucy! Awesome Facebook group, by the way! I will go back to see again. I have been waiting for ten years for this movie to be made into a series. let’s not give up now! Going back this weekend, taking my daughter.